I had just turned sixteen, and I was a junior at Marmion Military Academy on the corner of Illinois Avenue and Lake Street in Aurora, Illinois. Three blocks north at the corner of Indian Trail and Lake Street, John Esser had a used car lot. And there it was! 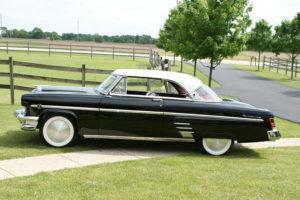 A 1954 Mercury Monterey Hardtop – Black & white with red & black leather interior. I loved those sleek lines, so I talked to Mr. Esser. The cost was $1,000. I had worked after school and summers and had the money saved. So, with Mom and Dad’s approval (and them agreeing to pay the insurance), I bought my first car. I was BMOC at school with this beauty. I kept the car until 1961 but have always carried a picture of my first car in my wallet. Move forward 49 years and I was looking for another ’54 Mercury. I ran across Bob Kuehn of Stanton, Nebraska, who was selling a ’54 Black Mercury Convertible. To make a long story short – I missed buying the car. 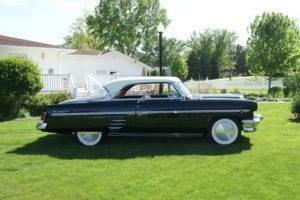 But after talking with Bob, I discovered he is also a ’54 Mercury lover and has restored many of them. After driving 10 hours to Nebraska to see his work, I was convinced he was the man to do a full restoration on my ’54 when I finally found one. After searching eBay and running an ad in the Mercury New magazine, I found my car in Proctorville, OH, from Roger Mayse. 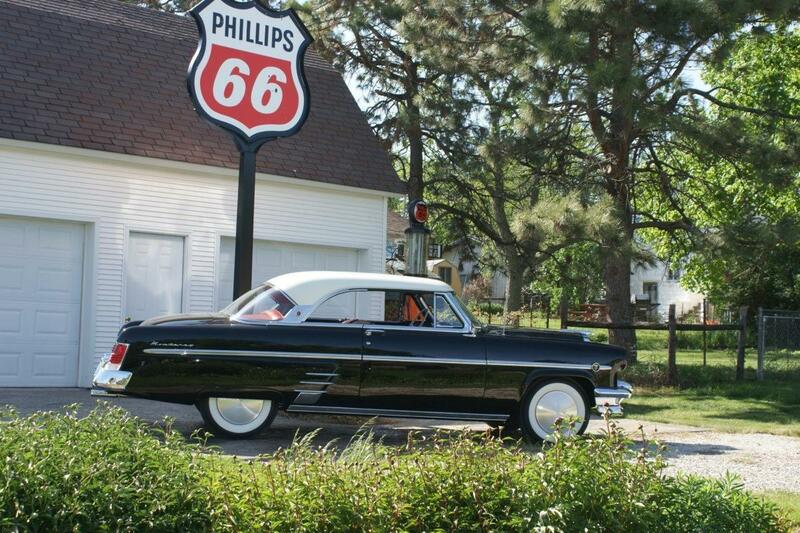 In January 2007, my ’54 was shipped to Bob in Stanton, Nebraska to start its journey back to being better than new. Well – 50 years later … here it is. 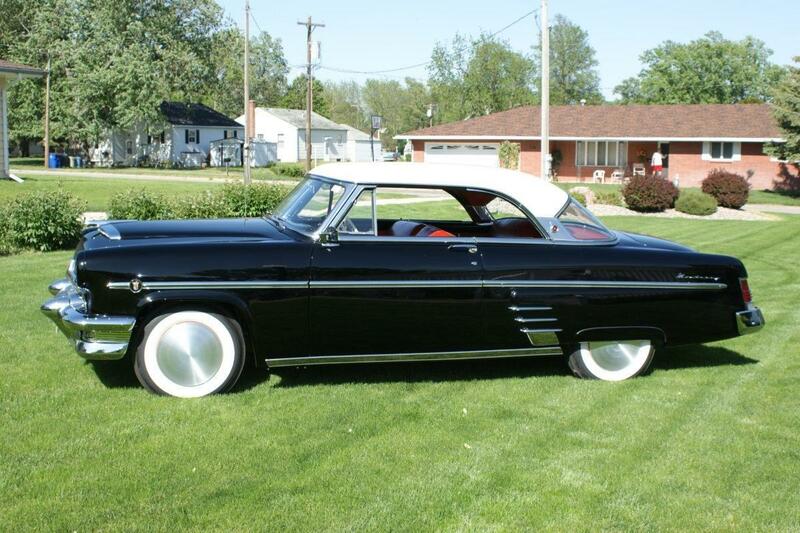 It’s like 1958 all over again for me – even with spun aluminum moon hub caps and glass-pack mufflers. In the world of collector cars, it is accepted practice to acquire a desired car after it has undergone expert restoration or acquire enough pieces and parts of a desired marque to conduct a full restoration. In the case of Ken’s ’54 Merc he chose neither of those routes. Instead he chose to “recreate” his first car from long ago. 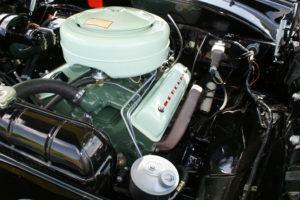 The process started with the acquisition of a nicely restored hardtop in very fine condition. To bring it back to concours condition and and perfectly match the first car he ever owned Ken commissioned Bob Kuehn in Stanton, NE. to undertake the recreation. Ken met Bob, a recognized Mercury restoration expert, during his nationwide search for the car of his youth. Bob dismantled the car piece by piece down to the smallest screw and washer. With painstaking attention to detail and incredible craftsmanship, bolt by bolt stitch by stitch, each piece was refurbished or replaced with NOS parts. Painted and reassembled, its trip back in time completed, it was ready to return magical and mystical memories of the sounds and smells from long ago into a living breathing reality once again. The ’54 is now a stunning masterpiece of “4,000 lbs. 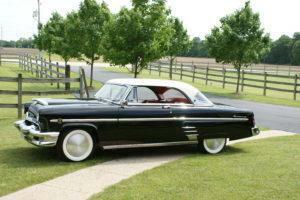 of Pure Decadence”, exhibiting the quality and style that Mercury was famous for. Sitting in the driver’s seat surrounded by the aroma of the original leather seats and a whiff of new paint, Ken turns the key to light up the ancient V8 and begins a trip to a different place and time. The familiar sound from the glass-pack mufflers exiting the chrome tipped dual exhaust is as distinctive as a Ferrari or Harley. Those in earshot know Ken is on the road again. Looking down the hood of his gleaming India Black Merc, windows open, wind blowing, racing along Butterfield Rd. on his way to school. The full disk spun aluminum “hot rod” hub caps creating the illusion of speed and it’s suddenly 1958 all over again. The Mercury marque of the Ford Motor Company was founded in 1939 with the purpose of selling entry level luxury vehicles to the upscale market between Ford-branded regular models and Lincoln-branded luxury vehicles. The Mercury name is derived from ‘messenger of the gods’ of Roman mythology. In the beginning years, Mercury was known for its performance. On Mercury’s 15th anniversary in 1954 the Monterey series included five different body styles, including the 2-door hardtop coupe. 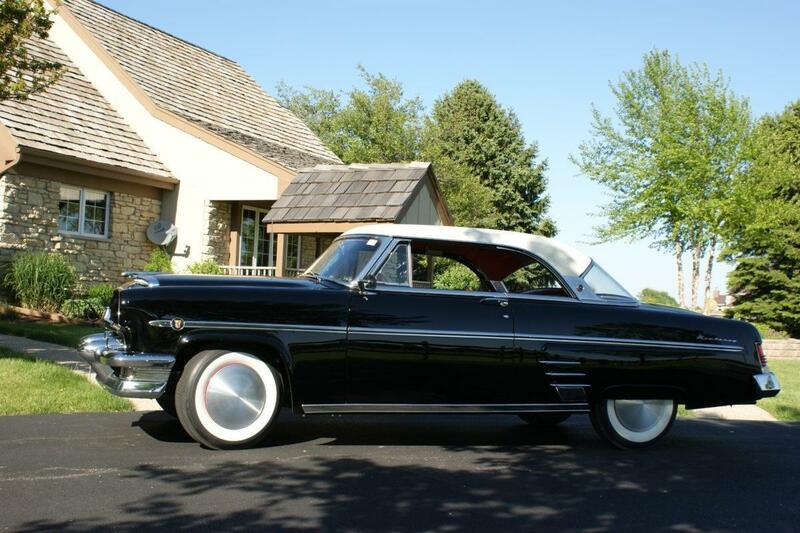 As it turned out the Monterey Hardtop, was the best-selling Mercury for that model year outselling the 4-door sedan by 13,538 units with 79,553 copies going out the door. Between 2002 and 2001 only 28 Monterey’s were gaveled down at collector car auctions. That there are not many of the type in circulation would seem to indicate that concours level restorations would be somewhat rare. William Schmidt, responsible for the Mercury Monterey’s special touches, took over the design work as well. A choice of either fabric-and-leather or all-leather seats were offered. 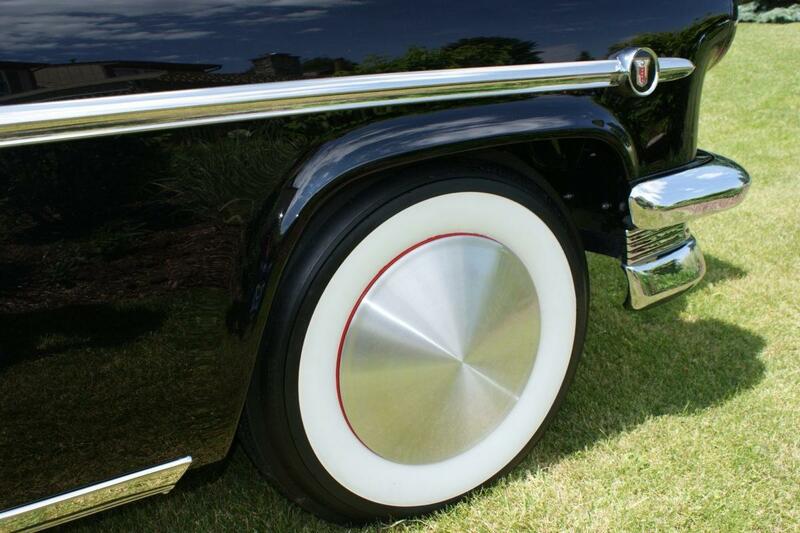 A deluxe steering wheel was showcased, and bright trim edged the windows on the inside. Color-coordinated interiors also matched the external theme, while special trim and badging were used both inside and out. The ’54 Monterey’s were given new wraparound taillights and a freshened grill with larger ‘bullet’ bumper guards. 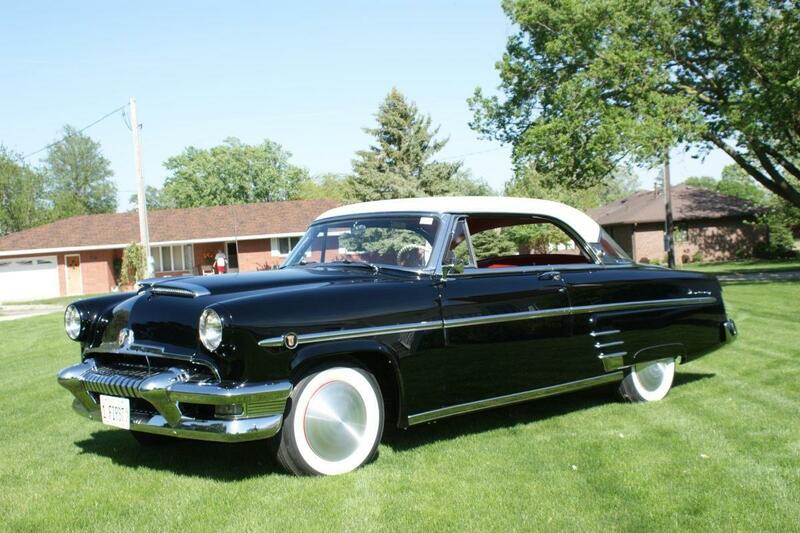 While Mercury and Lincoln shared many of the same design elements the Mercury was based on a Ford platform so the wheelbase was five inches shorter with a shorter overhang creating a sleek, compact, sporty look. 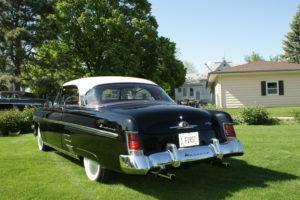 Mercury’s flagship sedan from 1950 through 1974, the classic Monterey was considered to be “4,000 lbs. of Pure Decadence”. 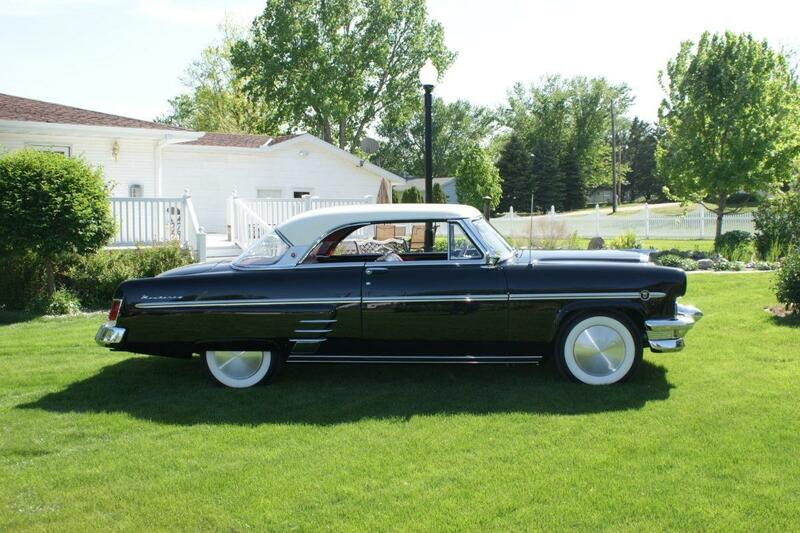 Still coveted even today, the sleek lines of those earlier models makes the Monterey a popular collectable classic.